MyFitFuel is now Trusted by 1,00,000+ Happy Customers. Thank You Every One For Choosing us. What is MFF™ Diet Whey Gold Protein? Diet Whey Gold Standard Protein Isolate is an premium protein which is made for advance workout benefits. Not only product is very rich source of 100% Pure and Premium Whey Protein Isolate with no other protein source. It’s also very fast to digest and absorb this protein which further helps in quick repair of broken muscle tissues after workout but also give good recovery and overall muscle gain. Every serving of Café Mocha provides 27.6 gm “Dry Basis” Protein & 26 gm “As is Basis” Protein. Making it a complete Protein, this Diet Whey Gold Standard Protein Isolate is rich in naturally occurring 12.7gm EAA, 5.9 gm BCAA, 4.2gm Glutamic Acid. Benefits of MFF™ Diet Whey Gold Protein Isolate? Premium Isolate Protein- MyFitFuel Diet Whey Gold Standard Protein Isolate provides 100% Premium grass fed Whey Protein Isolate. Whey Protein Isolate is 100% transfat free and has very high bio availability. 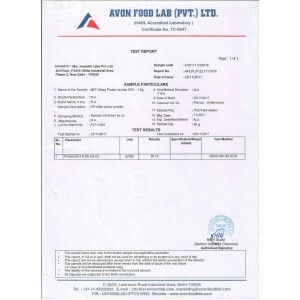 Not only this product is cholesterol free but also has almost negligible traces of lactose in it. Every serving of Café Mocha flavor provide 26gm As is basis pure Premium Whey Protein Isolate. Rich Source EAA (Essential Amino Acids)- Diet Gold Whey Protein Isolate contains a combination all the 12.7 gm essential amino acids in every serving. EAA’s - Essential amino acids are not synthesized by our body and are required from external source. When Essential amino acids combine with non-essential amino acids, together they make complete protein. This Gold Whey helps protein all required essential amino acids. High Source of BCAA (Branched Chain Amino Acid)- MyFitFuel Gold Whey Protein is high source of naturally occurring BCAA which has more Leucine. Café mocha Flavor provides 5.9gm BCAA. BCAA is combination L-Leucine, L-Valine, L-Isoleucine which helps in muscle synthesis and enhances overall muscle growth. Glutamic Acid- Every Serving of Diet Gold Whey Protein Isolate contains almost 4.2gm naturally occurring glutamine. Glutamine helps in faster post workout recovery and also helps to build strong immunity which helps to fight from bacteria and viruses. Our body post workout is warm and is high prone to such bacteria and viruses and our immunity helps to fight against them helping us to stay away from bacteria and viruses. Added DigeZyme®- This product contains added DigeZymes which are advance form of Proprietary digestive enzyme. DigeZymes is combination of 5 different enzymes such as Amylase, Lipase, Cellulase, Protease, and Lactase. These combination of enzymes helps in better digestion of protein and other nutrients help to get faster absorption of nutrients. 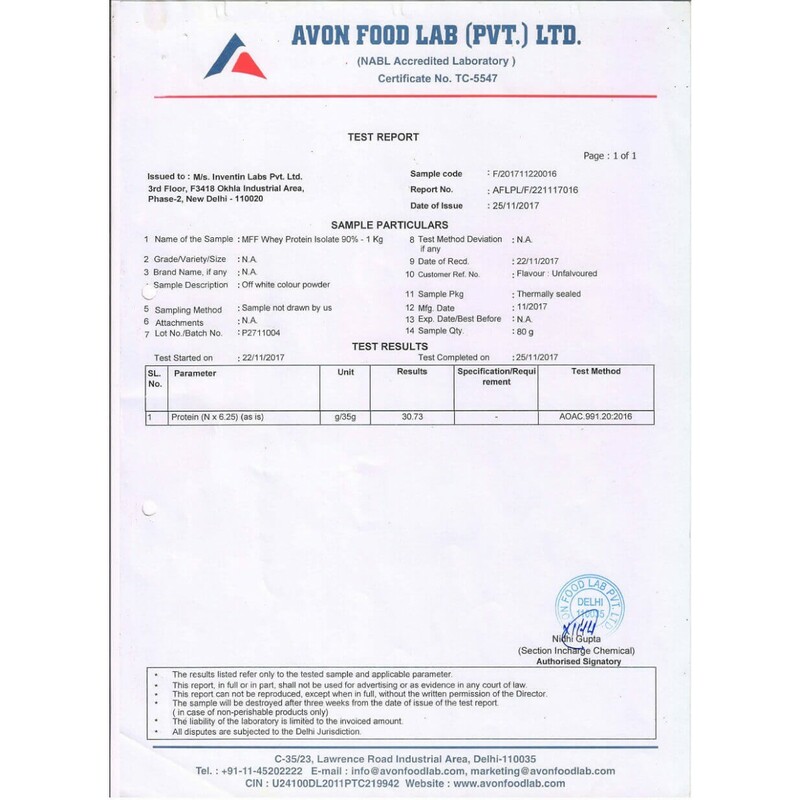 3rd Part Certified Protein Report - We believe in bringing high quality products such as Whey Gold Protein Isolate and we back our Nutrition values through 3rd Party certified lab reports. 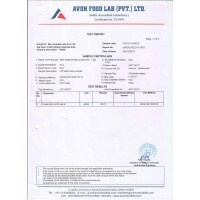 You can find the Lab report on product page for your reference. 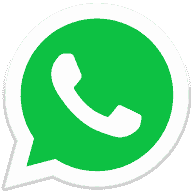 Our Protein are imported in India goes through different quality checks to bring high quality standard products in your hands. 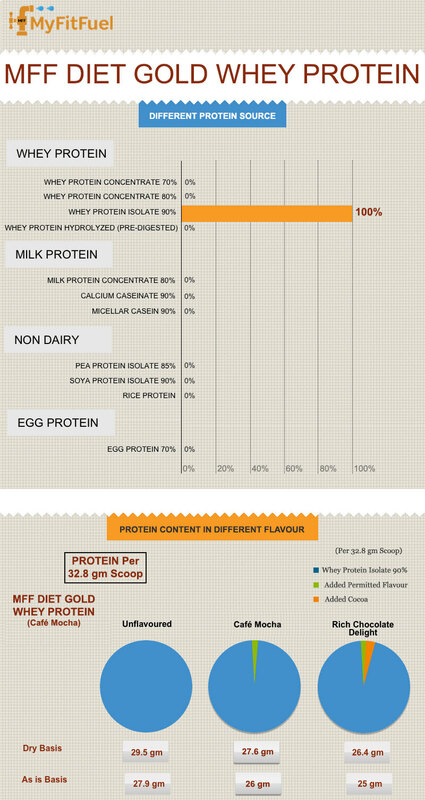 When to Use MFF™ Diet Whey Gold Protein Isolate? Diet Gold Whey can be used any time like before workout, during workout or post workout. It can also be used during any other time of day when an extra protein source in diet is needed. How to Use MFF™ Diet Whey Gold Protein Isolate? Add 180-240ml of chilled water in shaker and pour 1 serving in it. Shake for 15-30 seconds to get a lump-free, and creamy shake.